The UK’s biggest independent timber and panel product distributor, James Latham, has supplied 2.2m3 of Super Prime Walnut for the construction of an elegant staircase, which is now the focal point of a luxury new build residential property in Louth at the foot of the Lincolnshire Wolds. 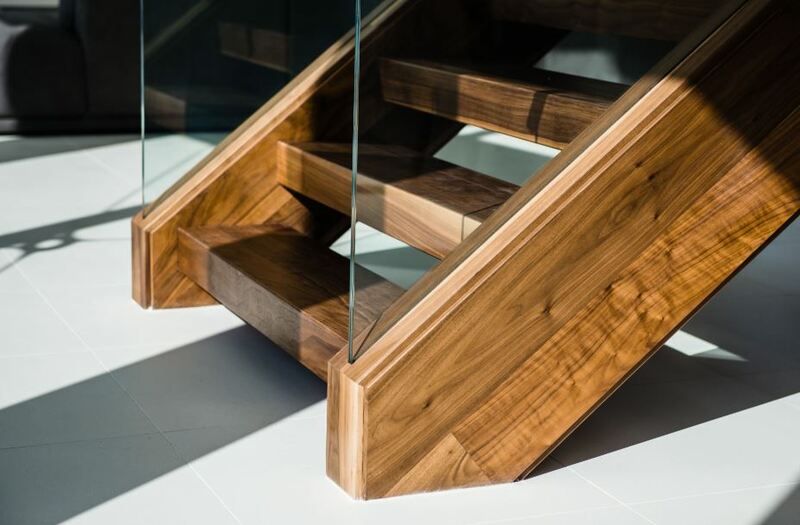 The Super Prime Walnut was specifically chosen for its wonderful warm appearance to complement the striking panes of glass on the staircase which were selected to create the sense of open space. Lincs Design Consultancy (LDC) were commissioned by the owner of the property to design this luxury home and were briefed to create and build a contemporary and luxurious dwelling. The leading, multi-discipline Louth consultancy specialise in creating synergy between architecture, planning and sustainability so they were the perfect choice for this project. A key part of the design brief – set by LDC and led by Associate, Chris Burkitt – was to construct a contemporary house with outstanding joinery features. GW Clark Joinery of Hull was appointed to focus on the installation of the staircase and after two weeks of meticulous bespoke carpentry, which demonstrated phenomenal craftsmanship, they produced this stunning centrepiece to the home. GW Clark’s brief was to ensure that the staircase appeared to have glass seamlessly pouring out of the Walnut, with all the joints and aluminium being completely concealed. The result more than achieved this and they also used a lacquered finish rather than oiled as the lacquer is harder wearing and easier to maintain and keep clean. In addition, they clad the staircase with the same Walnut planks but decided against matching nosing as they wanted to create a rustic floating appearance.